With WWE 2K14 just a few short weeks away, there’s still some questions fans need answered, questions they often ask about the state of the WWE franchise and its future. 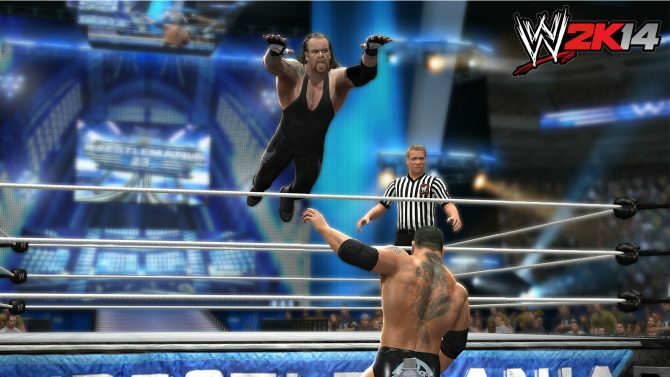 Cory Ledesma, a developer who has been with the franchise for most of the series, agreed to sit down with me and tackle some persistent questions fans have had about WWE 2K14 and future installments. Check out the full interview below! Masoud: What are the benefits of working with the 2K brand? It seems like the one thing on everyone’s mind is if anything has changed with the teams melding together under one banner? Cory: It’s been a great experience working with 2K and being part of that family. The first thing we noticed when we joined the team was that the culture of 2K is one of high quality and authenticity. That’s what they care about the most, so they kind of breed that into their culture and you can kind of tell that takes precedence over anything else. We loved to hear that as our team moved over and joined on, since we hold a lot of the same qualities in high regard, and so we know that support is going to be there when it comes to pushing for higher quality. That means more time, spending more money, whatever it is–more resources to get the job done–that’s what they’re known for, and you can see it in their sports games. Obviously NBA [2K14] is a fantastic game and really, really high quality, so that’s one of the big things we noticed. Also [2K] have a really strong passion for the brand and WWE. We didn’t know what we’d get with that, but they have a lot of fans over there and they really love the brand, support it, and want to see a lot of the authenticity stuff that we want to see as fans creating in the game. Really that’s been the most noticeable thing. 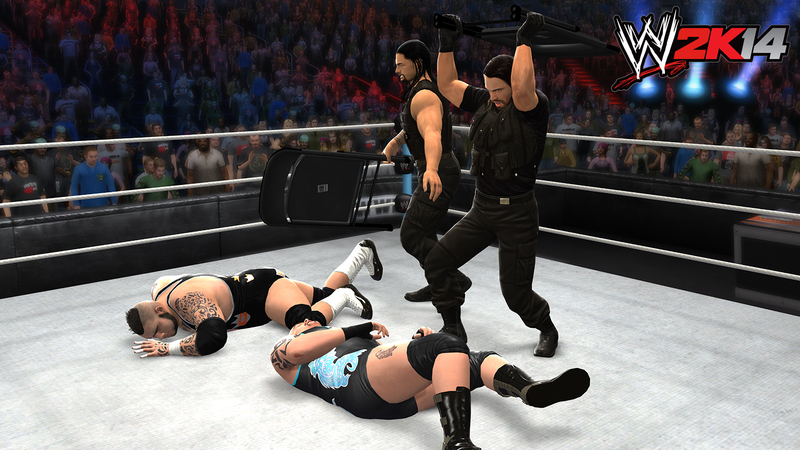 And they’re making their impact right away, and we’re having that support right away with WWE 2K 14. It’s only going to get stronger and grow more and more in future iterations, and you’ll start to see a lot of the same qualities you see in the NBA games in future WWE games. Masoud: Rivalries have always been incorporated under-the-hood as part of Universe Mode: what was the reasoning behind making it a distinct component that could be tweaked and controlled? Cory: Adding more control to the Universe Mode is what our fans obviously want, as much as they can get (and rightfully so). Before you had to rely on the A.I. providing those rivalry setups for you, or you had to manually go in there and do the tweaks yourself, by setting certain superstars with certain allies and certain enemies, or you had to book the matches constantly for each individual show, which was a little too tedious or monotonous. So we wanted to set up an easy way to just go in and say “Hey, I want Universe to setup these rivalries and have the storylines revolve around these characters,” and so that was the primary motivation of adding that feature in there. What fans will be able to do is set whatever duration they want for these rivalries as well, and have a lot more control than they’ve had in the past years to be able to dictate the kind of storylines they want in the WWE Universe, so I know they’re going to be really happy to have that change. The more control we can have in Universe the more we know players can get enjoyment out of that mode, so actually I think all of our editions besides just adding more storylines have been centered around adding more control for the player in Universe. Masoud: Have you ever considered the idea of importing CAWs (Create-a-Wrestlers)? Cory: I have seen the same request for the ability to carry over creative content from one year to another and it’s not something you can do in WWE 2K 14, but something we will continue to look at. It’s something that has challenges for us to be able to support that, just with the complexity of all the content that comes with one wrestler. For example, the Create-A-Character we’re talking about, the animations for his moves, all his parts, the morphing you did to his body, music, movies that you used and given to his entrance, if any of those are missing or altered the previous year, we have to support that and fill that in. And it’s not like it’s anything that’s impossible and it’s something we’ll continue to look at, but there are some hurdles we’ll have to overcome as we continue to look at that. Who knows: next year we may be able to support it, the year afterwards, we’re not really sure definitely what the answer is yet but just know that internally we do have those discussions if there is a good approach we can take. Masoud: For the Divas: there’s been a rising amount of control of what the Divas can do. Before at times they didn’t have as much match options as the [Male] Superstars, and now you’ve told me you can do a whole brand with just the Divas. Are they able to do all the matches that are in the game right now or are there still some restrictions? Cory: The major restriction is obviously that we don’t have male versus female, or Superstar versus Diva matches. That’s really the only major restriction. There’s some other minor ones, like blood can’t be caused with the Divas, and there may be some small match-type restrictions, but for the most part we’ve opened up to support match-types as much as possible for the Divas. We really don’t worry about those restrictions so much that they can fight in a Cage Match or whatever kind of match, it’s not a big issue, it’s more just on who their opponent is, Diva or male, and blood and that kind of stuff. Masoud: Now is that to prevent the idea of aggression towards females, as a socially conscious choice? Or is that a directive from WWE? Some fans can of course think back to Chyna or Kharma or wrestlers like that who have been able to go against the guys. Is there ever going to be choice where players can decide that for themselves? Cory: We stay in line with what you see on WWE television, so that’s our motivation. We want to be 100% authentic to television via simulation of that brand, so that’s really where we look for guidance. That’s the approach we take. If it’s not prevalent to television, then it’s not prevalent for our game. Masoud: Will the training arena return? You remember, there was the gym a few games ago where you could learn the new controls and all that? The last one didn’t have it! Cory: (Laughs) I’m a real fan of the training mode. 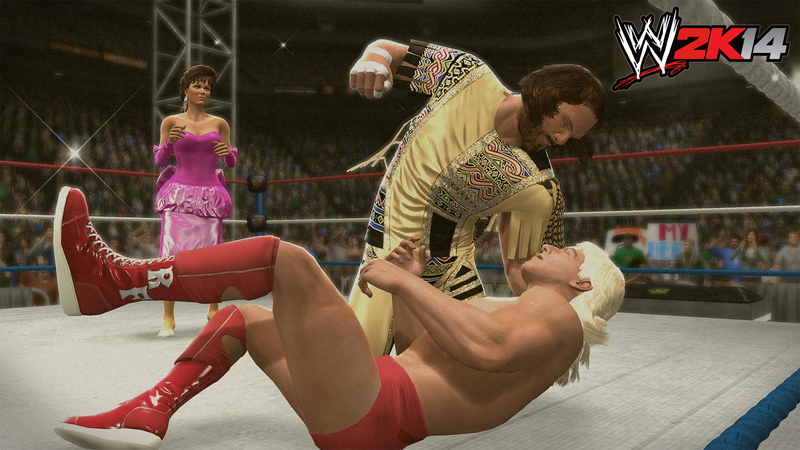 It’s not in WWE 2K 14. Maybe in the future we’ll bring something like that back. I’m a fan of it, and the ability to learn the game in a non-threatening way, especially for our casual users. At some point we’ll look at bringing that back, but it’s not in WWE 2K 14. Masoud: Will the General Manager Mode return? The Universe Mode encapsulates some of it already, but there are some fans that really miss the GM Mode. Have you heard that before? Cory: I have heard that before. I hear a lot about a lot of game modes that we’ve had in the past games (laughs). Masoud: I’m now imagining there’s this huge list, like you guys need this huge wall of everything people want. Cory: We would love to have every single mode, every single permutation, every single option available, and we try to keep the game within its scope so that we can make sure there’s not quality lost, to make sure nothing is neglected, that the game isn’t so big that you can’t manage it. But we definitely see Universe Mode as having a lot of GM Mode control, and we think it’s kind of the best of both worlds. Really, the biggest thing about GM Mode is the constant competition, where you’re either able to go against the A.I. or a friend using a kind of ratings score. That’s really the only thing major that is missing. Sure there was some things missing like drafts, which really isn’t a big part of the WWE right now, and there were things like being able to buy writers for storylines, things like that, which again isn’t part of the WWE right now. But there are a lot of things in Universe Mode that fans are excited to see, like the Rivalry Manager, which I think is something you would see in a GM Mode. 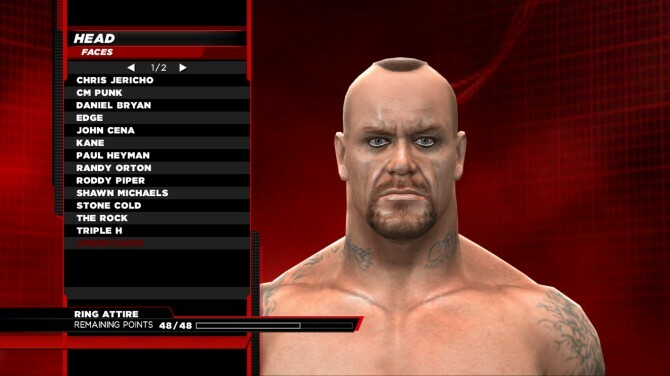 We’re going to continue to look at bolstering the Universe Mode with those kind of customization options, and then in the future we can continue to look and see any other GM Mode-esque like features we want to bring in. But I think we look at Universe Mode as a way to fill that void. Masoud: Will we ever be able to free-roam arenas again? Cory: (Laughs) That was a whacky, whacky mode. Masoud: I remember being able to go out onto the street outside Madison Square Garden, get on the train, fight on it, get out in Times Square, and keep fighting. Even get hit by cars! Cory: Some of the old games allowed you to go in Times Square or Madison Square Garden and throw snowballs and jump off a helicopter! Yeah, they were pretty whacky (laughs). We won’t be going that whacky again, but when we look at that again, we’ll be doing it the right way. Cory: I was a fan of that mode as well, and would definitely be interested in seeing that kind of mode return, though we would have to see how it would fit–perhaps a set of Tag Team matches, maybe following Shawn Michaels’s career during the Attitude Era. M: I imagine it would be a little harder now, since it used to be a local co-op experience, and now having to consider the popularity and ease of online multiplayer…. It’s a whole different gaming atmosphere. Cory: Yeah. Much different. Though if we can make it work, it could make a return one day. Masoud: Who is your favorite wrestler? Cory: (laughs) That’s a hard one. Masoud: Classic or current if it makes it easier? Cory: Hmmm. Currently or all-time? As a kid growing up, I was a HUGE Macho Man fan. Cory: I grew idolizing Macho Man, I think he was awesome. Nowadays I’m big fans of The Shield. I think all three of them are really impressive as Singles [Division] wrestlers because they’re that good. I’m a big fan of Daniel Bryan, of course, CM Punk, and Antonio Cesaro is really great. It’s hard to just say one, I think. But I appreciate those that are technical matches, those Superstars that can put on any good matches, and not only that, but each match is different, and ring psychology is going on, you can sell me into anything, whatever it is. Whether it’s an injury you’re selling, or whatever. I can appreciate your skill and your craft, and I just recognize you as a great Superstar, someone who can put on a great show, and that’s what’s most important to me. Masoud: Last question. Are we ever going to be able to smell what The Rock is cooking? Cory: (laughs) I don’t know if you want to smell what The Rock is cooking, but in WWE 2K14, you can definitely smell what The Rock is cooking.